The Gaboon Viper is a venomous snake which is found in the rainforests of Saharan African. 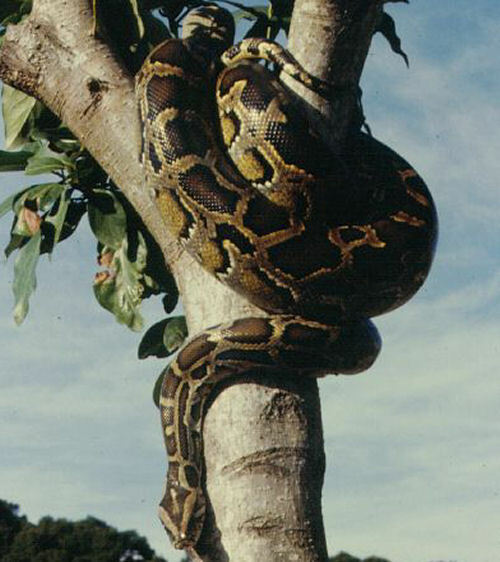 It is the largest member of its genus, and also the world’s heaviest viper. The Gaboon also has the distinction of have the longest fangs and the most copious amounts of venom of any other snake. Adults are stocky and relatively short, but very heavy bodied. They average about 60 inches long but will weigh as much as twenty pounds. The Gaboon viper sports a tiny horn between its nostrils and stripes below the eye. The head is very large and triangle shaped, with an extremely narrow neck making it appear more triangular. They are usually found in the forests and woodlands, particularly at low altitudes, or in thickets and plantations in Tanzania. They are mainly nocturnal, hunting at night, and they have a reputation for being very slow moving, and particularly placid. Waiting for their prey to simply pass-by them, they are reported to be very tolerant and placid in temper as well, however they do occasionally bite. Even when handled they will rarely bit or hiss. They feed on birds and mammals, doves and many kinds of hares or mongoose, and even stranger, there have been reports of porcupines and antelopes. During mating the males will engage in physical combat, intertwining their necks and squeezing each other. Gestation of the little snakes takes about a year, and they give birth in late summer. Bites are rather rare, due to their good tempered nature, however when it does occur it should always be considered a serious medical emergency. Even a bite from an average sized specimen is potentially fatal. The venom is not particularly toxic but is mass produced.